Now I don’t have to say that, really. The many awards the film is getting since it first made a buzz at the TIFF (Toronto International Film Festival) last year, where it received a standing ovation, should really be enough to prove that this film deserves the top Oscar award this year. My vote goes to Tom Hooper’s “The King’s Speech.” Sorry, Nat and Darren Aronofsky. Monarchy, flawless British accent, impeccable performance of the whole cast, splendid cinematography and interesting, albeit predictable, storyline win over a ballet story anytime, in my opinion. Colin Firth (Pride and Prejudice, Shakespeare in Love, Mamma Mia!) , who plays Duke of York and eventually, King George VI, really did a bloody great work on this one. Flawless. He portrays the role of a monarch who struggles to overcome his stutter in order for him to gain the respect and the trust fit for a king that he really is. But Bertie (as he is called by his family) has to work really hard on it especially when his father died. There wouldn’t really be a problem if only his older brother, who’s the next heir to the thrown, didn’t fall in love with a divorced socialite, which is a big no-no in the monarchy. He eventually has to renounce his crown in order to marry the girl everyone cannot accept. The Duke of York is then forced to take over the monarchy. Bloody hell for him. Fortunately, he got a loving and very supportive wife in Elizabeth, the Queen Elizabeth no other, played splendidly by Helena Bonham Carter (Sweeney Todd, Harry Potter, Alice in Wonderland). 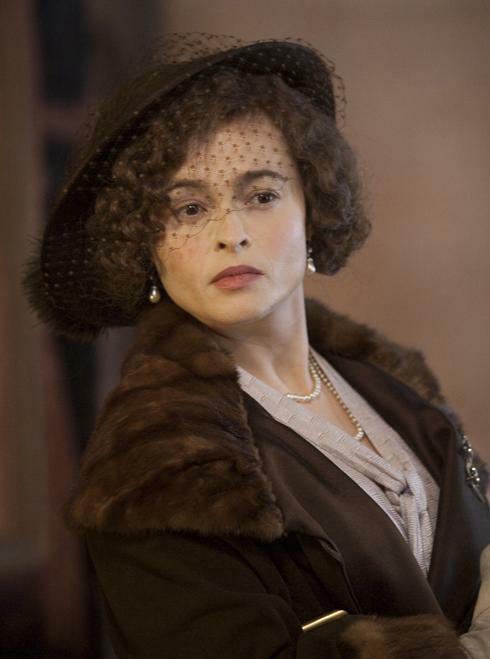 Mrs. Lovette/Bellatrix Lestrange/Red Queen has turned into a very regal wife to a monarch. She played it so well. She can be a majestic queen and be a loving wife and a doting mother in every scene she is needed to be any of the three roles. I like the way she quickly purses her lips as if with a swift smirk, but doesn’t really express disapproval or disgust. She does it perfectly in one scene when she saves everyone from the awkwardness of being asked if “their Majesties be staying for dinner,” when she and her husband meet Lionel Logue’s overwhelmed wife for the first time. Lionel Logue, played wittily by Geoffrey Rush, is Bertie’s Australian speech therapist, who is mistaken at first as a doctor and also happens to be a failed actor. Their first meeting doesn’t turn out well as Logue insists on calling the Duke of York by his nickname Bertie and that, in turn, he’ll be called Logue or Lionel as what friends do. With a bit of refusal to comply with the therapist who insists on “my castle, my rules” decree, eventually the two become friends as Logue teaches Bertie relaxation techniques, encourages him to sing what he wants to say (so cute) and be what the monarch really needs him to be–a friend who listens to him. Their conversations are highly entertaining. David Seidler has written the script so brilliantly that every scene of Bertie and Lionel is highly entertaining. Here’s my favorite exchange of lines. It’s when Bertie is having doubts of being capable to rule as a king and recalls his father’s great skill in giving speeches. Logue: But he’s not here anymore. And the he ended the conversation with, Your face is next, mate. The scene where Elizabeth is consoling Bertie as he cries, saying the people are making a mistake in giving him the crown because he is not a king, is heartwarming. Here’s a king, a British one, who doesn’t show strong emotions in public (case on hand: when the King dies, the Queen doesn’t even shed a tear nor console her crying elder son), crying and losing confidence–it’s a scene not easily forgotten. And who would forget “kinging”? Funny word, that one. And, do you know the “F” word?, asks Logue. “F-fornication?,” answers Bertie. Funny. However, though, I couldn’t shake off the feeling that Timothy Spall is still playing the role of Beadle Bamford in Sweeney Todd and Wormtail in the Harry Potter series. Only this time, he’s wearing a tux as he’s playing Sir Winston Churchill. And what’s with the wave? It’s a little too dramatic, in my opinion. But, maybe that’s how the Royal Family waves to their people. The story is predictable as I have said. Not only because it’s based on a historical account but also because we have seen a lot of this story of overcoming a hurdle and succeeding in the end. Of course, in “The King’s Speech,” as Logue puts it: “…And that’s all you say, four short responses. Kiss the book. Sign the oath. And you’re King. Easy,” King George accepts the title, kisses his full-time father duties goodbye, signs special decrees, beats his speech impediment and be the King. Easy. He then also remains friends with Logue, who later was inducted into the Royal Victorian Order for being of great service to the Crown. I don’t care if the film remained faithful to history (I studied History of Modern Europe in college, but this is not included in the topic, so) nor if the filmmakers blew up some stuff here and there to make it more dramatic as it is. If they did, well, they did a bloody remarkable job. And that’s all I care about. Hail to “The King’s Speech”! This entry was posted in Spud Times and tagged Colin Firth, David Seidler, film, Geoffrey Rush, George VI, Helena Bonham Carter, The King's Speech, Tom Hooper. Bookmark the permalink.